I have so many details to share! I’m in love with this canvas. You know I love tiny details and this canvas has lots of them. There’s a logic to the stitches, threads and techniques I choose. The more details, the more I can share the inner workings of my mind. It’s a scary place filled with lots and lots of crazy ideas. Sudden Realization by David Galchutt is our current mystery class. Let’s talk about Outlines. 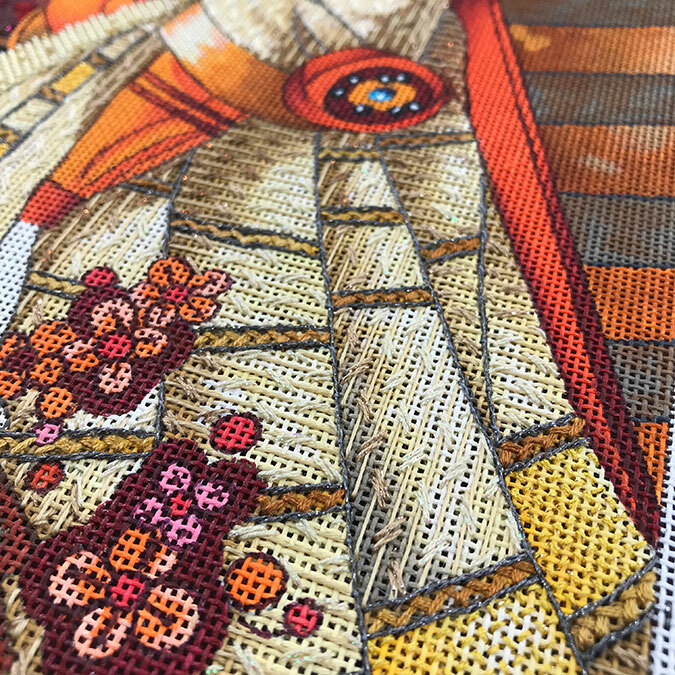 Outlines in needlepoint are always a challenge. If you stitch them in Tent Stitch you get bold cartoonish outlines. That’s not for me. I err on the side of softer gentler outlines. Even with softer outlines I still like to create depth and variety. Sudden Realization is painted on 18ct. My heaviest outlines on this canvas are worked in Outline or Stem Stitch using a single strand of Very Fine (#4) Braid. Very Fine (#4) Braid is a thin thread, but when stitched in Outline or Stem Stitch, the threads overlap making the line twice as thick. The thick outlines frame the the narrow tan Herringbone stripes on the gown. There are significant outlines between the folds of the skirt and in the sleeve of her dress. These should be lighter than the decorative outlines. For these I couched Very Fine (#4) Braid in position with a single ply of 100/3. 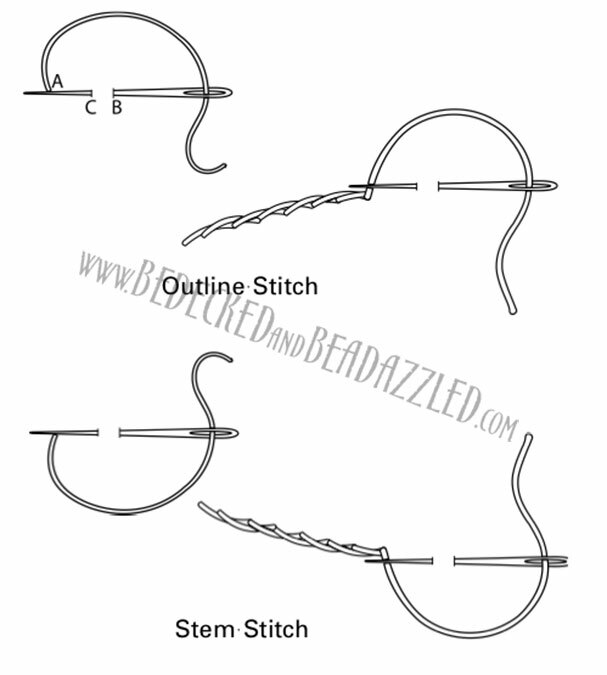 The couching stitches should not show, so make certain that your needle goes up and down in the same hole under the thread you are couching whenever possible. 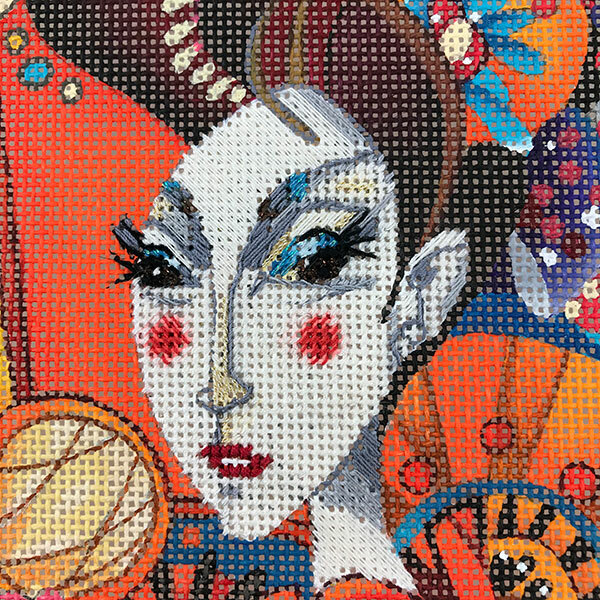 Finally for the tiniest outlines, those on her face, we used 100/3 for the Outline Stitches. 100/3 is really sewing thread so its tiny, tinier than a ply of silk. If even an Outline Stitch of 100/3 seems to thick I will simply leave the line unstitched and allow the paint to show through. 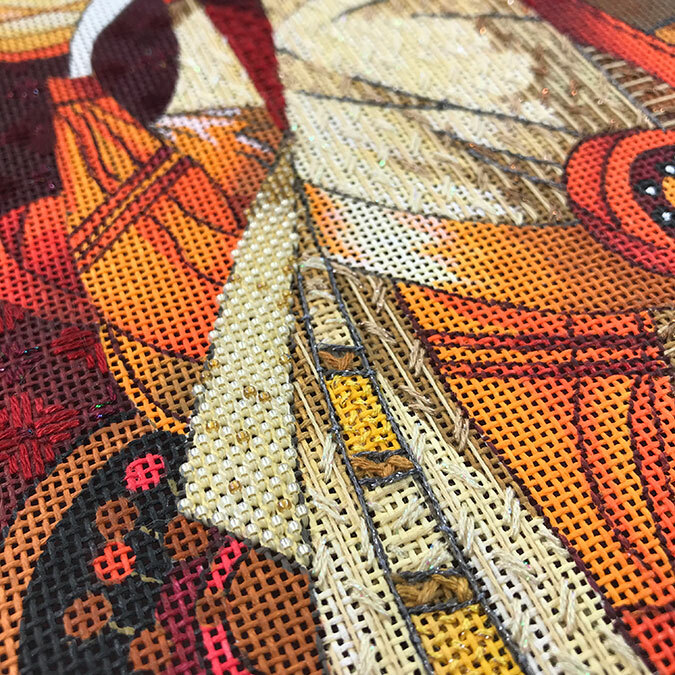 Hopefully these tips will help you scale your Outline Stitches on future canvases. If you are stitching on 13ct, I would use Fine (#8) Braid and a single ply of silk floss. Beyond the Outlines, we completed the gold bands on the gown in T Stitch and added a beaded tie to the front of her gown. It was time to add beads! The beads are brick stitched following the colors as painted. Just to add a little extra detail I mixed a few darker beads randomly into the light. It definitely speaks to the feeling the rest of the gown has. I still have more details to share from this lesson but I will save them for tomorrow. Stay tuned the top of the gown is super fun. If you would like to join the fun and stitch this with us, here’s the link, or give us a call at 410.296.0405. That canvas is gorgeous and I appreciate the outline tips. Thank you. Your insights draw attention to the subtlest canvas details with sensitivity, thus making your finished works unique. You offer very specific information so we can re-evaluate and then focus on parts of our pieces that would otherwise go untouched. So much perception! Haven’t started her yet but getting very eager! She’s so detailed! What’s been done so far is as fantastic as she is.